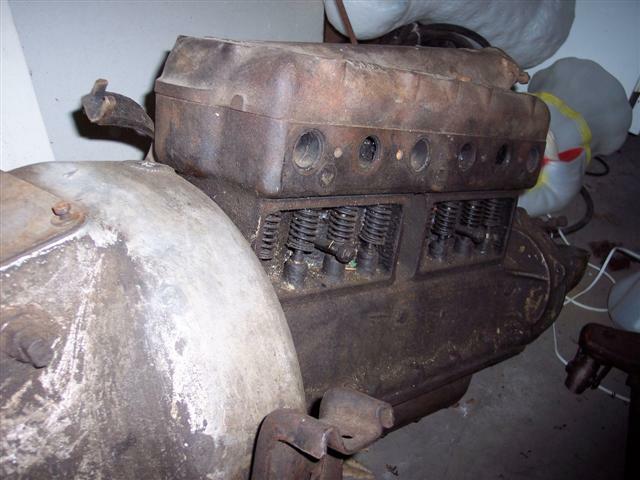 Model T Ford Forum: Is this Engine worth anything or Scrap metal? Is this Engine worth anything or Scrap metal? 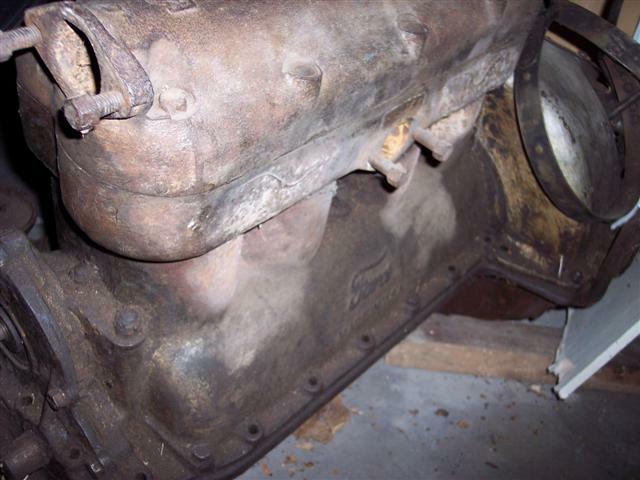 Model T Ford Forum: Forum 2009: Is this Engine worth anything or Scrap metal? Any engine can be saved if enough money is used. That to me looks like a save able engine that I wouldn't mind having. Whether or not the entire engine is any good, there might be individual parts worth using. 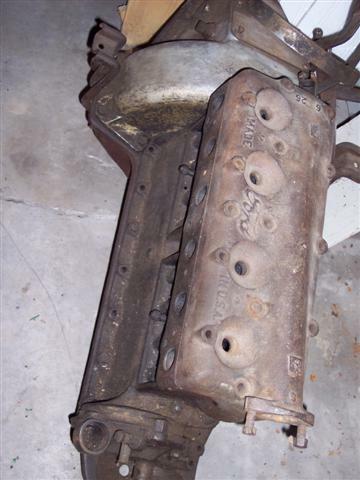 That looks like a low head, which is more valuable than a high head, and the hogs head and transmission parts as well as the crankshaft. It is impossible to tell what parts would be useable or not without disassembly and magna flux, but it could have some good useable parts, maybe even rare ones. I am sure there are people near Chicago who will help you with your "Problem"!!! A June 1913 engine. I don't know why you wouldn't bring it along, if it is with the speedster. Plenty of salvagable parts, and maybe just a headgaskit problem. Thanks for all the input. I had Fed Ex Car transport the car to me, but they wouldn't transport the spare engine. When I got quotes from Regular Fed Ex, and other shippers either crating or securing on a pallet the estimates came in around $950 and higher to ship. I may have a family member from Michigan pick it up, then when I visit MI I could bring it home to NC. Either way it will be alot of effort, and I wanted to know if anyone thought it was worth the effort. Thanks for your thoughts, I wasn't sure if the hogs head, pan, front cover, head, crank, etc may be worthwhile, hard to tell without tearing it all down I think. I'd save it. 1914 blocks don't fall out of the sky! Try getting a quote from FREIGHTQUOTE.COM, they sure help me. I have about three cracked blocks, and I really hate to just pitch them, so what do I do them? I don't want to be part of our wasteful society. Where is the engine exactly? I am in Mich about 90 miles from down town Chicago. Well,dont that year of engine have the labeled peddels which are scare,a aluminum hog head is worth a good bit as I have seen them go for over 150 each around here. I would say if there is any reasonable way to get it home to do it. Keep 'em all. My bride came outside a few years ago while I was struggling to unload an old, stuck Ford V8 flathead engine that a guy had given me and wondered, "What are you going to do with that?" I told her, "Probably nothing. But, as long as I've got it there ain't nobody gonna melt it down and make Toyotas out of it." Is this a joke or what? 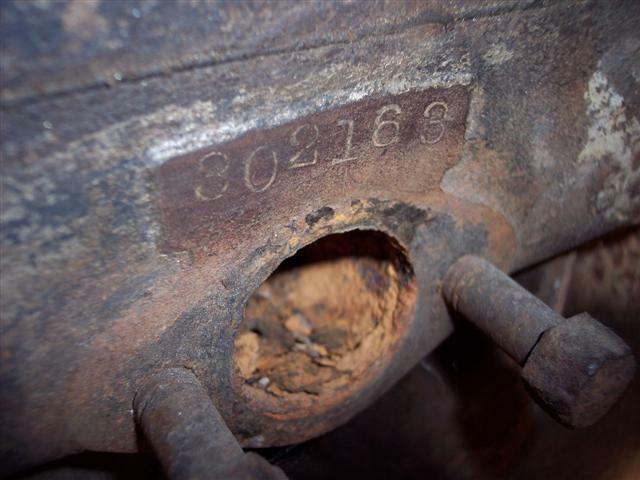 Really guys, if you have any 1913-14 engines that you want to throw away (cracked or not), please give me a call. I've seen cracked 1913 stripped blocks offered for as much as $900.00 at swap meets and I've seriously thought about paying that. (However, I'm out of a job right now, so I won't be buying anything for awhile). Not a Joke, just trying to find out some information about the value of this engine. Yes it does have the Aluminum Hogs head, and labeled pedals, the oil pan, and the motor turns over. It has a water jacket repair just to the right of the engine serial number, but must be considered cracked until it gets (magna-fluxed?). I have been contacted by a nice member in Chicago who is interested in purchasing for $300 sight unseen and picking it up. Seems fair! Sorry this has turned out to seem more like a classified, it wasn't my intention. I was just trying to find justification in spending the $1000 + or - on shipping to get it home. Rick, you never know. I brought my 19 roadster home and drained the oil to find water in the oil. The engine would not crank over. Because I noticed the lifters were welded/reground I looked further and pulled the head to find nearly new Ford valves. My guess is the engine had a fresh rebuild 40-50 years ago. I did put stainless valves in before touring. I soaked the cylinder in Marvel Mystery oil and worked at turning it over for two weeks before it began to move. I ran this engine on many tours for four years. It had the heavy rods and cast iron pistons. but it would pull the roadster along at 45 mph all day. Crank finally let go on a tour on a hill about 160 miles from home. Rebuild it with light rods and alum. pistons. someone is building a true to year car the block is very desirable. I bet the guy is nice if you offered it to him for $300.00. Sight unseen it's worth a lot more than that. Rick: Shipping should be a lot less than $1,000 plus/minus. I have shipped complete engines from the lower 48 to Alaska on a pallet for just a few hundred dollars. Sell it on ebay, with pick it up locally as the only option. Lots of responses already, but what is another 2 cents. If you wanted to give it away, I would be willing to drive from California to pick it up. But I am sure you can do better than that. The last cracked block engine that I had was not repairable, but made a good display mounted on an engine stand for a tractor museum in Homer, NY. The paint totally covers the crack and the block looks almost like new. The four cylinder early tractor engines were almost identical. The last cracked block engine that I had was not repairable, but made a good display for a tractor museum in Homer, NY. The paint totally covers the crack and the block looks almost as new. The four cylinder early tractor engines were almost identical. Thanks to all for the great input, I have had emails with offers to rebuild it, donate it to charity, lower shipping quotes ($500) and offers to purchase the engine. Thanks for everyones thoughts!